Police are appealing for information after three cars were stolen during burglaries in Crumlin in the early hours of Tuesday, October 3. “Police received a report of two males acting suspiciously in the Laurelvale area around 1.10am. Entry was forced into a property and a number of downstairs rooms were ransacked. A grey Ford Kuga was stolen from the property,” Sergeant McCrea said. “A second burglary was reported in the Crosshill area at 2.30am. A green Volkswagen Lupo and a black Ford Fiesta were stolen from the property. 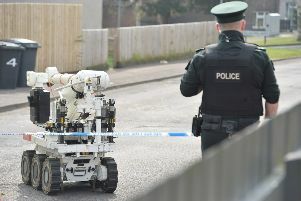 The Kuga was later recovered by police in the Hannahstown Hill area, although the driver made off from the scene. Police have appealed for anyone who noticed any suspicious activity in the Crumlin area in the early hours of Tuesday morning to contact them on 101 quoting reference 48 of 03/10/17.